. It has two pairs of gold-plated RCA inputs and two pairs of gold-plated RCA outputs so you can keep both of your favorite rigs sounding excellent without having to change cables and switch settings all the time. This versatile vacuum tube phono preamp provides highly flexible options and settings for a wide range of phono cartridges — from moving magnet, to high- or low-output moving coil — to ensure top-notch performance that's tuned perfectly for your system. Its vacuum tube output helps to create a spacious soundstage with no noise, so your precious vinyl sounds exactly the way it's supposed to. The DS2 features adjustable input capacitance settings for moving magnet and high-output moving coil cartridges, plus gain-setting options to better match your cartridge to your system. A switchable subsonic filter protects your amplifier and speakers from power-wasting low-frequency rumble below 20 Hz. Tube Phono Preamp: The Pro-Ject Audio Systems Tube Box DS2 is a tube phono cartridge preamplifier. This tube phono preamplifier benefits from outstanding circuit technology from Dr. Sykora and uses high-quality components. All components including tube output (ECC83 x 2) and polypropylene capacitors are audiophile-grade to guarantee a breathtaking sound experience. MM/MC Compatible: The Pro-Ject Tube Box DS2 phono preamplifier offers amplifications and RIAA equalization for MM and MC cartridges. 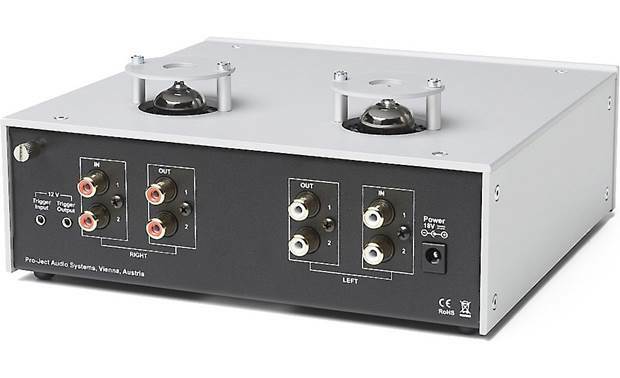 Input Gain: The phono preamp's input gain can be adjusted to 40dB, 45dB, 50dB, 60dB, or 65dB. Input Capacitance Adjustment: Input capacitance can between 100pF, 220pF, or 320pF (designed for high-out MC and MM catridges). Subsonic Filter: The Subsonic filter (-12dB @ 20Hz) can be turned on or off, and helps to reduce low-frequency rumble and wasted amplifier power. 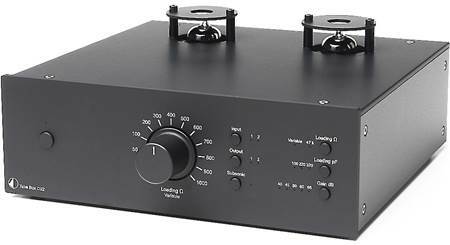 Two Selectable Line Inputs/Outputs: The Pro-Ject Tube Box DS2 is equipped with two sets of gold-plated line-level inputs and outputs which offers connection of two turntables, plus two receivers or integrated amplifiers. The gold-plated RCA connectors offer corrosion-free signal transfer. 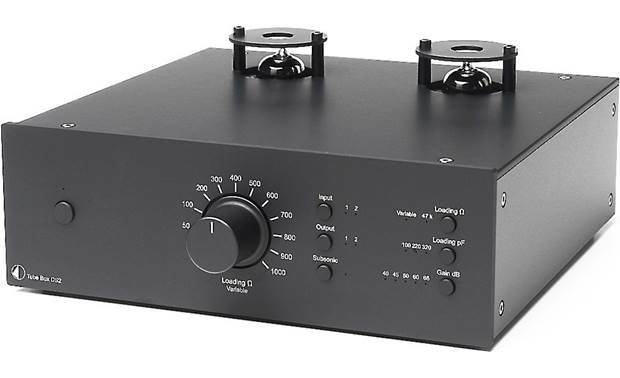 Power Requirements: The Pro-Ject Tube Box DS2 turntable preamplifier operates off of standard household current using the included external power supply. The outboard power supply helps reduce noise and interference. Trigger Input/Output: The Tube Box DS2 is equipped with a 12V/2.5mm trigger output and 12V/2.5mm trigger input to turn on/off the preamplifier and connected turntable remotely from a receiver with 12V trigger connectivity. 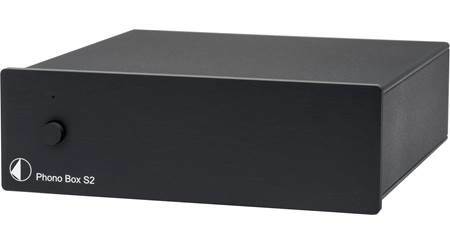 Metal Case: The tube phono preamplifier features a metal case that shields the electronics from vibration and electromagnetic interference. 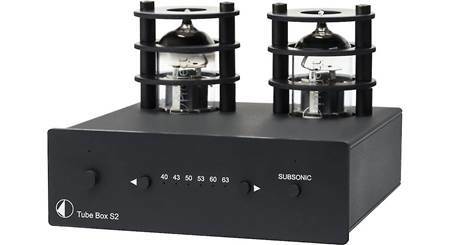 Searches related to the Pro-Ject Tube Box DS2 Vacuum tube phono preamplifier for moving magnet and moving coil cartridges.